The narrative of the Middle East believed by most people today is that Israel has no right to exist as a nation and has been occupying land belonging to innocent and peaceful people. And this, even in a time when many are waking up to the fact that government, media, and academia are known to lie and twist everything. Let us examine the evidence and question what we’re told. The following information is mostly a highlight and summary of an article at http://emetnews.org. Of course, it’s easy enough to find counter-claims and disputes of the historical record presented here, and anti-Jew sentiment is a rapidly growing phenomenon today. But while the Old Testament is all about the Hebrews and their historical claim to the land since ancient times, no such claims are found in the Quran, which was not written until the 600s a.d. And the Bible cannot be dismissed as historical record just because it’s the Bible. Past critics of the historicity of the Bible have been silenced as archaeology has continued to discover evidence supporting the Biblical narrative. When the Romans conquered Israel, they renamed the area Palastina (derived from “Philistine”) as an insult to Jews.There was never a nation or ethnic class called Palestinian, and there was never a distinctly Palestinian archaeology, coinage, language, or culture. But Hebrews had lived in the area since about the 13th century b.c. Though the Romans had been governing the land in the first century a.d., they had allowed the Jews some autonomy until destroying the nation completely in 70 a.d. Visitors to the area in the centuries a.d. before the Balfour Declaration of 1917 reported the area to be empty, abandoned, a desolate wasteland. 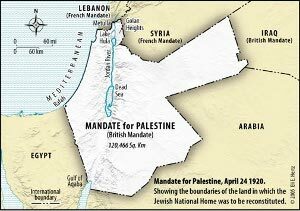 The Declaration, confirmed by the League of Nations Mandate, originally included the area of Jordan (see map), but it was violated and less than 1/4 the land promised to the Jewish people was actually granted. In spite of the limitations and interference of Great Britain, the area became fertile and prosperous. At first it was the Jews who were called “Palestinians”, so it is the Arabs who have "occupied" the land and displaced the true "Palestinians"
Hamas leader admits, “There is no such thing as a ‘Palestinian’ people”. Most people today believe that Israel is the aggressor and terrorist state that “occupies” the area claimed by the “Palestinians”. So the propaganda against Israel has been very successful. But it is quite remarkable that the same people who claim to be “awake” and rightfully distrust the media and government will blindly swallow the artificial narrative and history of Israel and its surrounding enemies. Few even bother to look at a map of the Middle East (in spite of the advent of Google Maps) and see how ridiculously small is the land of Israel compared to the lands of the Arabs. Fewer still bother to question what they are told by media, government, and anti-Jew professors. And fewest of all are those people who actually read the history of the area. As we read in Proverbs 18:17, the first to present their case always seems right, until they’re cross-examined. Let us all practice thorough cross-examination of everything we’re told.